Len Lye is a controversial figure in New Zealand art, an internationally renowned and influential artist who is seen by some as an outsider whose art has little relevance to the local tradition. Lye was born in Christchurch in 1901. His father died three years later and Len was raised by his mother and various relatives. In 1908 the family moved to the Cape Campbell lighthouse, after his mother remarried. Although only there for a year, the experience was formative, with references often reappearing in his later art. After finishing school Lye attended Wellington Technical College, taking commercial subjects until 1918, when he switched to art. In 1922 he moved to Sydney, working briefly as an animator and experimenting with kinetic sculpture. In 1924 he moved to Samoa, but within a matter of months was, he said, ordered to leave because of the way he had ‘gone native’. By November 1926 Lye had settled in London, producing abstract paintings, batiks and sculptures. In 1928 he was elected to the artist collective Seven and Five Society (Frances Hodgkins was to join the following year). New Zealand newspapers, picking up on reviews in British media, started publishing stories about this ‘Futurist New Zealander’ who had ‘caused a sensation’ in London with his ‘mechanised art’. In 1929 Lye began film-making, combining Māori, Aboriginal, Samoan and modernist influences in his animated works. Unable to afford a camera he experimented with painting directly onto film, with Colour box (1935) winning a medal of honour at the Brussels international cinema festival. In 1944 Lye visited New York and he was so impressed that he decided to stay on. He became involved in abstract expressionism, producing films and kinetic sculptures, earning an international reputation. He gained American citizenship in 1950. After urging from Hamish Keith and others, Lye visited New Zealand in 1968 and again in 1977, during which the Govett-Brewster Art Gallery in New Plymouth offered to build large-scale versions of sculptures he had never been able to realise. 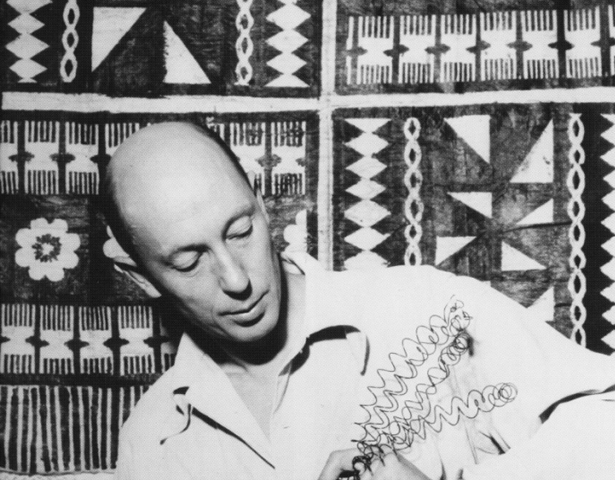 Len Lye died in 1980 in New York, and bequeathed all his major works to the Govett-Brewster. Read the full entry in the Dictionary of New Zealand Biography. See Flip and two twisters (1995), by Shirley Horrocks (via NZ On Screen). We have 8 biographies, 2 articles, related to Len Lye.